We require wristbands for everyone entering the pick-your-own areas, which allows us to identify people who are in the orchard as paying pick-your-own customers. This leads to greater security for us and for you, ensuring that everyone who is on the property is accounted for. It is also a way for us to keep overall costs down by ensuring that everyone is paying for the fruit they pick. WRISTBANDS ARE FREE ON NON PEAK DAYS – MONDAY THROUGH THURSDAY, excluding holidays. Wristbands are always free for children five years old and younger who are accompanied by a paying parent or legal guardian. Wristbands are $2 for customers 6 years old and up on peak days (Fridays, Saturdays, Independence Day, Labor Day and Columbus Day in 2018). Read orchard president Ed Weaver’s description of our pick-your-own experience & the crop outlook for 2018 here. Season: Late June. Finished for this year. Avoid all the red berries. 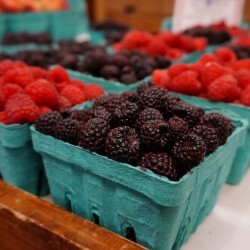 They are not red raspberries, just unripe black ones! Pick only berries that are such a deep purple they are almost black. Ripe berries separate from the bush easily. You should be able to just roll your fingers across them into your bucket. Avoid light red berries and berries with white or yellow tips. Look for deep red berries that drop off the core easily. Be careful not to fill your containers too full or else you will have smashed berries on the bottom. We’ll give you any extra containers you need! Visit our blog for recipe inspiration!